Chlorine Free* Not Whitened With Chlorine* Safer for Sensitive Skin-No Dyes or Fragrances Soft, Cloth-Like Cover for Comfort Ultra-Thin Protection, Longer Length for Heavy Flow Days Secure, No-Slip Adhesive With Wings for Best Fit You Are Making Difference: Your choice of our chlorine free* products helps reduce the amount of dioxin polluting our air, water and soil, and helps make the world a safer, healthier place for your family and generations to come. Ultra-thin Pads, Super Long with wings Not whitened with chlorine* Safer for sensitive skin - no dyes or fragrances Soft, cloth-like cover for comfort Ultra-thin protection, longer length for heavy flow days Secure, no-slip adhesive with wings for best fit Most pads and pantiliners use absorbent fibers that have been whitened using chlorine-containing substances which creates dangerous toxins, like dioxin. Studies have shown a direct link between dioxin exposure in the environment and cancer, birth defects, and reproductive disorders. 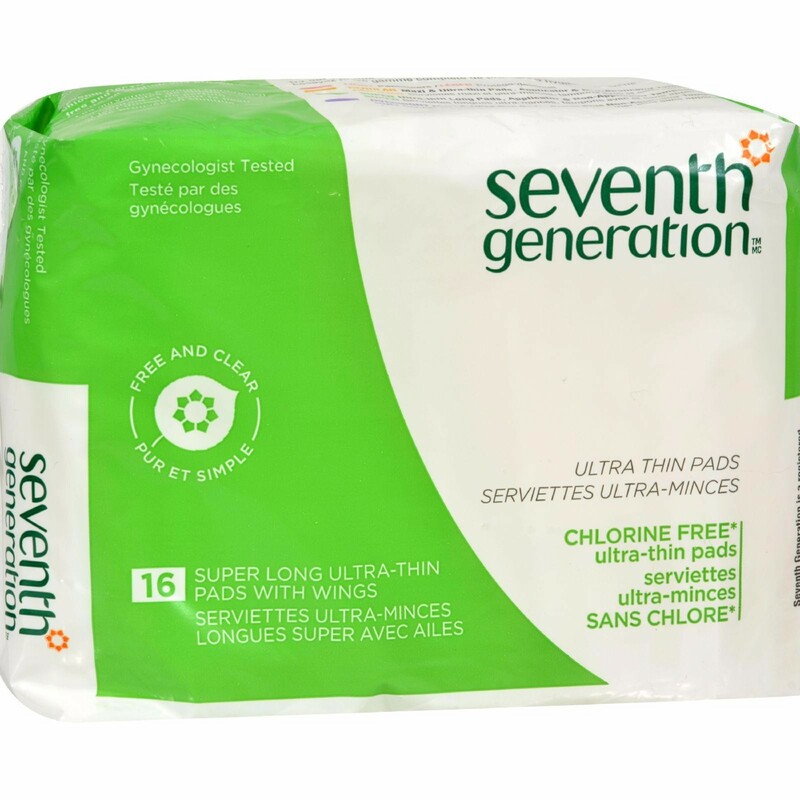 The absorbent fibers in Seventh Generation pads and pantiliners are chlorine free. We also use a natural absorbent material derived from wheat. You've made a healthy choice for your body. *The removable peel strip is whitened with a chlorine-containing substance. We're working to eliminate this exception so the entire product will be chlorine free.